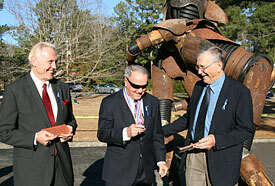 Former Alabama All-American Gaylon McCollough, left, retired Florida State Coach Bobby Bowden and former Auburn All-American Jackie Burkett share a laugh during the unveiling of the Iron Bowl Monument on 22 January 2010. Perhaps there is room for civility when Alabama and Auburn play. Two time-honored veterans of college football’s greatest rivalry proved it while helping the United States Sports Academy unveil sculptor Bruce Larsen’s Iron Bowl Monument. The Iron Bowl Monument, by 2009 Sport Artist of the Year for Sculpture, Bruce Larsen of Fairhope, AL. It was class personified on 22 January 2010 when two former All-American centers from national championship teams, Jackie Burkett of Auburn’s 1957 team and Dr. Gaylon McCollough of Alabama’s 1964 squad, represented their schools in the ceremony. The ex-players were joined by a legendary coach and native Alabamian, retired Florida State coach Bobby Bowden, who tossed a coin to determine which player would be the first to lay a brick and also choose what side of the monument to place it on. Burkett won the coin toss and surprised the crowd gathered by deferring his choice to McCollough. The classy Burkett didn’t have to think twice about the decision, saying it was the right thing to do considering how well the Alabama football team, which won the national championship two weeks earlier, represented the state. McCollough, who grew up idolizing Burkett, appreciated the gesture. “He was the reason I wanted to be a center,” said McCollough, who snapped the ball to Crimson Tide football legend Joe Namath during his playing days in Tuscaloosa. The sun-splashed warm day was a perfect backdrop for Larsen’s latest and most ambitious project for the Academy. 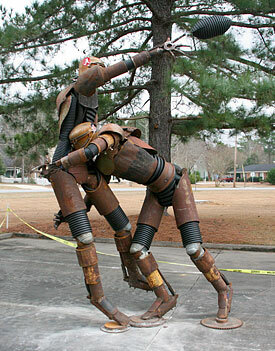 Fairhope’s Larsen, the 2009 Sport Artist of the Year for Sculpture, introduced the initial phase of a project that will eventually become the largest monument dedicated to American football.  Future plans are to include twenty-two figures in the monument, signifying the number of athletes on a football field. The first phase features a quarterback trying to elude the grasp of an onrushing defender. The second phase will consist of a wide receiver trying to get open against a defensive back. The Alabama-Auburn rivalry was named the Iron Bowl as a nod to the city of Birmingham, which hosted the game for many years before it moved to the schools’ home stadiums. Birmingham has a rich background as a center for iron and steel production. Fans of the rivalry may purchase bricks of their own to make their allegiances known. Purchases will help form the foundation on which the Iron Bowl Monument will stand and help the project grow over the years. For a tax-deductible donation of $50 a brick, you can leave your personal stamp on the rivalry. Contact the Academy at (251) 626-3303 to become a unique part of Iron Bowl lore.